Lane splitting is illegal in Colorado, though one motorcycle is allowed to share a lane with another motorcycle. The “M” motorcycle endorsement allows someone to drive both two- and three-wheel motorcycles. The “3” endorsement allows for the operation of only three-wheel motorcycles. Pass the motorcycle written exam; purchase a motorcycle instruction permit; schedule and pass the motorcycle drive skills test; and purchase a new driver’s license to add motorcycle endorsement. Complete a Motorcycle Safety Foundation (MSF) course; present the original Motorcycle Safety Foundation card in a driver’s license office; and purchase a new driver’s license to add the motorcycle endorsement. The state of Colorado accepts motorcycle endorsements from other states. Under Colorado law, minors under 18 are required to purchase and hold a motorcycle instruction permit for 12 months before adding the motorcycle endorsement to their license, and those under 16 must be under the direct supervision of the MSF motorcycle instructor at all times while operating a motorcycle. Despite statistics that support helmet use, Colorado does not require adult motorcycle drivers or passengers to wear helmets, although all operators and passengers under 18 years of age must wear helmets that meet or exceed U.S. Department of Transportation (DOT) standards for motorcycle helmets. The correlation between motorcyclists who don’t wear helmets and the increased risk of fatal injury is something that cannot be ignored. According to the U.S. Department of Transportation’s National Highway Traffic Safety Administration (NHTSA), 87 riders and passengers were killed in motorcycle accidents in Colorado in 2013. Of those killed, 55 percent were not wearing a helmet, and 31 were. Stated simply, wearing a helmet significantly reduces the risk of neck or head injury. According to the Motorcycle Safety Foundation, a helmet protects the head and face, cuts down on wind noise, deflects bugs and other objects flying through the air, contributes to a rider’s comfort during variable weather conditions, and helps reduce fatigue. Colorado law requires that motorcycles be equipped with footrests for passengers and that passengers utilize them. Passengers are required to ride on the seat behind the driver or to the side in a sidecar, never in front of the driver. Passing or overtaking a vehicle in the same lane is illegal in Colorado; however, one motorcycle can share a lane or “co-ride” with another. Riders cannot attach one motorcycle to another vehicle (towing). Colorado law requires motorcycles to have one mirror, as well as a muffler, and the state also has noise restrictions in place for motorcycles. Colorado has no restrictions regarding passenger age, helmet speakers, turn signals, and handlebars. Lane splitting is illegal in Colorado, meaning no person may operate a motorcycle between two lanes of traffic. Riding in the center of a lane generally makes a motorcycle the most visible to other vehicles. 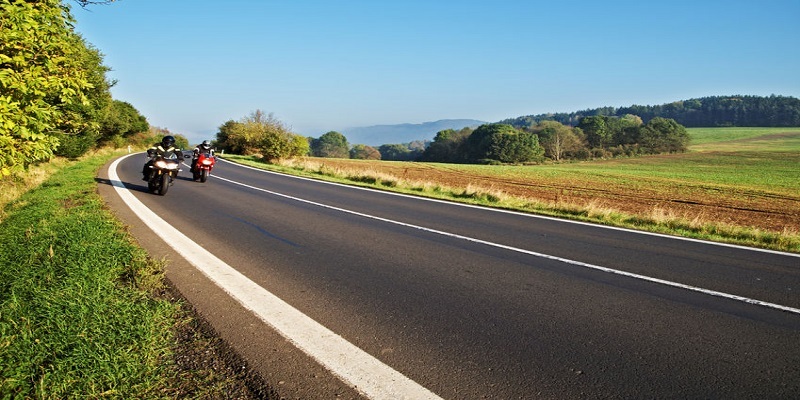 Although riding two abreast in a single lane is allowed in Colorado, for maximum visibility, motorcyclists should ride offset, not directly beside each other. Injured in an Accident Involving a Motorcycle? If you have been injured in a motorcycle accident, the fastest way to find out if you have a case is to schedule a free consultation with me. At the Law Offices of Daniel R. Rosen, our goal is to get you through your motorcycle accident and injury claim as quickly and smoothly as we can. I’ve earned over $100 million in settlements for my clients and personally handle every single case that comes across my desk. I can get you the settlement you deserve, and you won’t pay a penny until I come through for you. Fill out this form to tell me about your accident and schedule a free consultation.